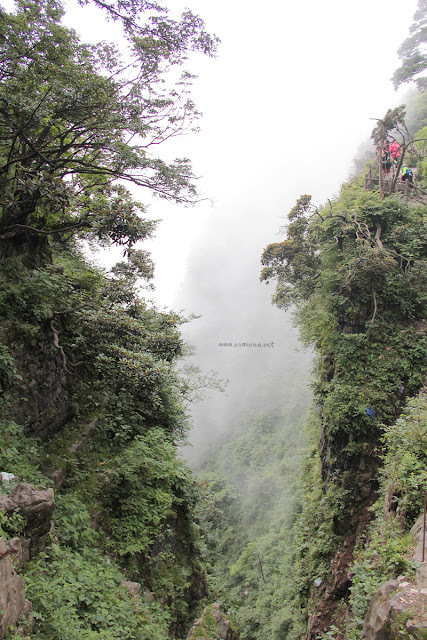 Mount Emei / Emei Shan (峨嵋山) is a mountain in Sichuan Province, China, and is one of the Four Sacred Buddhist Mountains of China also the highest at 3,099 metres (10,167 ft). This place is listed as one of UNESCO World Heritage Site. Honestly, I wasn't that excited to visit this place lol but I heard that this mountain is so high and surrounded by clouds! The journey was so long, I took like few hours of bus ride and climbed thousand stairs to be here. If you like to see anything green with mist from a high view, you'll love this place. My local guide said that we must be careful with the monkey so many people bought a piece of bamboo to scare the monkey. But I think the monkey doesn't even want to come out because there're so many people that day. I couldn't take many pictures because I must climbing thousand stairs lol, I was afraid that I probably lose my breath haha but everything was okay cos I drank many water! So don't forget to bring your water. So this is the Golden Summit, many people come here to pray and so many snack stalls there. But most of the meat is pork, so try another option like sweet potato, white bread, corn and banana. I bought one banana and white bread for snack, don't try the white bread if you hate bland taste. Overall, I think this mountain is beautiful. I love natural scenery and all the greens. The air is also really fresh, it's nice to slowly walk around with friends and try the local snack there. But to think that I spent a lot of times to get there, I won't visit this place again I think, hahaha. This is a gorgeous wedding venue in Los Angeles. I went here some time back and was impressed the second I stepped through the door. I'm hoping that I'll get to go back for other events to enjoy great company and beautiful surroundings.